Cashback Match™ Discover will match all the cash back you've earned at the end of your first year, automatically. There's no signing up. And no limit to how much is matched. College students. 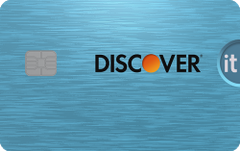 This card's rewards are the same as Discover it Cash Back, but no credit history is required -- 5% back on rotating categories (for up to $1,500 a quarter) upon enrollment, then earn another 5% when Discover matches your cash back at the end of your first year. This student credit card is among our top picks for the best credit cards of 2019. Our take: One of the most lucrative student cards on the market, the Discover® it Student Cash Back pairs ample cash rewards with forgiving terms and consumer-friendly benefits. Ratings and reviews provided by issuer as of 2017-12-04. See the latest reviews on the card issuer's site.